For anybody who has used a design application like the Adobe Creative Suite products, the idea of docked palettes is not a new one. 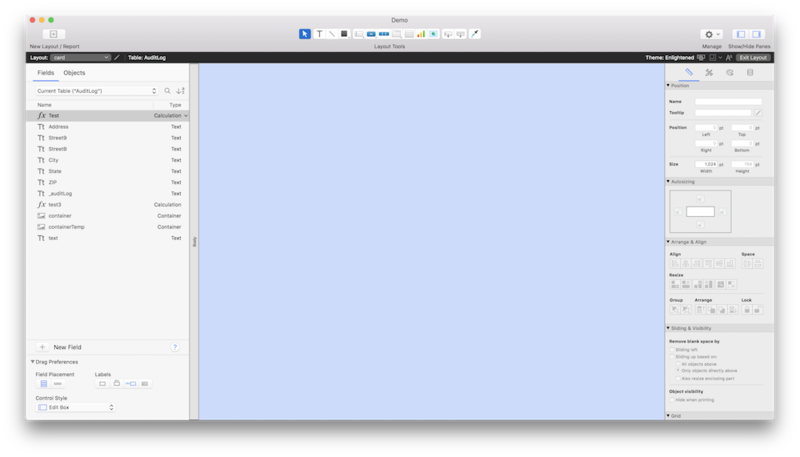 FileMaker has adopted this behavior and permanently adhered the Field Picker, Object Palette, and the standard Inspector to the left and right of our layout. I know for me, this saves time managing the various floating palettes (which previously always found a way to be floating exactly where I needed to be working). The Field Picker and Object Palette can be found on the left side of Layout mode, with tabs on the top to switch between the two. They function much the same as before, but, since they are tabbed, they take up less space. Another benefit is that since you will no longer be closing the Object Palette to conserve screen real estate, the object-level hiding capabilities there are much more consistent and useful. One notable change is that the width of the palette is resizable, allowing for longer field names to be visible in the Field Picker interface. Also, you can now select the control style of a field being dragged onto the layout (in addition to the placement and label options from previous versions). With the Object Palette now more universally visible to us, it is also worth mentioning the powerful filtering capabilities that this tool gives us. You can filter objects on your layout by type, or use the Search box to simultaneously search field names, object names, or strings within text objects. The standard Inspector palette now lives nestled on the right side of the window. Some minor changes to the Status Toolbar have happened as well. On the left, we have lost the ability to click through the layouts in the solution the way you click through records in browse mode. Control + Up/Down Arrow will still allow you to cycle through your layouts. 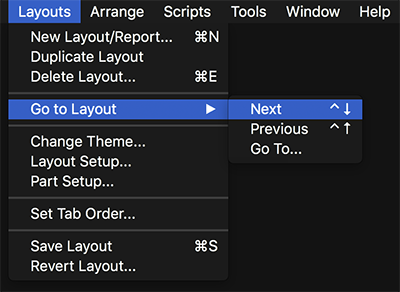 If this shortcut doesn’t work for you, check that you don’t have this keyboard combination bound to something else in the OS by going to System Preferences → Keyboard → Shortcuts. The Button Setup dialog has seen a minor improvement as well. Prior to 17, when assigning a Script Parameter to a button, it was a two-click process to see if the button was passing values to its associated script, and three-clicks to edit the values. With the new Layout mode, the parameter is now visible in the button setup dialog, saving us a click. While this may not seem like much, I’m sure you’ll notice and appreciate it the next time you are adding distinct parameters to a 12-segment button bar. Grouping of objects has long been a helpful way to keep your layout organized. 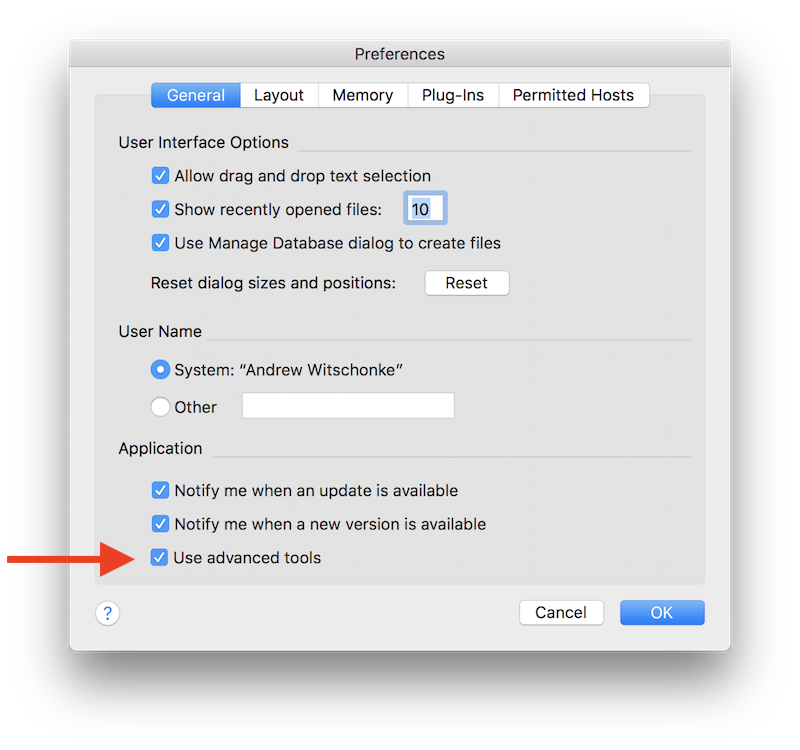 The problem with the implementation of groups in FileMaker was always that you had to ungroup the objects to make any real changes. When the object toolbar was added in FileMaker 16, we got the ability to change some appearance attributes and conditional formatting of an object while it was still grouped, but that was about it. Now you can edit a grouped object in place. To do it, simply click on your group, then click again on the object you want to edit. The boundary of the group will change to a dashed line to indicate that you are working inside the group. 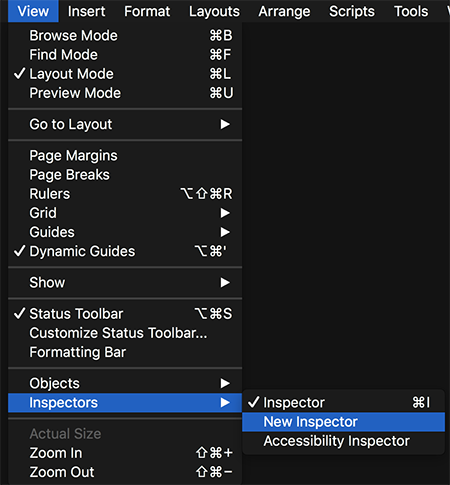 If you really can’t stand the thought of losing your floating Inspector palette, you can always hide the right palette and add a “New Inspector” from the menus, just like in previous versions of FileMaker.